When you arrive in Africa, your first night is not your most difficult. You are usually so tired that you just crash. Slightly rested, your body forgets that you are 7 hours ahead, failing to adjust your biological clock. Last night, I was up at 02:00. Today, I am up at 03:30. It is getting better. Yesterday I had an experience that I will never forget. Baby Angel was born premature weighing 1600 grams. When I saw him on my first day in Rwanda, he was already two weeks old, surviving on glucose infusions. It was clear he had a high intestinal obstruction. In our hospital, we would have most likely kept the baby on total intravenous nutrition until he increased his weight and age, and then repaired the obstruction. Here, this is not an option. The fact that this baby has already survived without adequate nutritional support is testament to the endurance of Africa’s children. I suggest we try to access the intestine for feeding without repairing the obstruction. 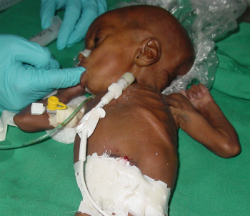 The baby would most likely not survive a general anesthetic, especially with no ability to ventilate him after surgery. Dr. Denise Chen, an anesthesiologist from Boston Children’s and her resident Beverly, along with her Rwandan anesthesia resident, offer to perform a spinal anesthetic. This would be my second neonatal laparotomy the same day under a spinal anesthetic. The first one was a struggle but we got the job done. This one will not be any easier, but it is the baby’s only hope. We explore the baby to find exactly what I had expected, a bowel obstruction quite high in the intestine. There are plenty of intestines past the obstruction to use for feeding. But the bowel is the size of wet noodles. We try using one of the feeding tubes I brought with me, but it is clear that it will traumatize the bowel. I come up with an idea I’ve never used before, using a small Broviac catheter as a feeding tube. These catheters are meant to access blood vessels, and after all, this bowel is the size of a blood vessel. When I was packing my bags in Montreal, I had to triage what to bring with me, because the space was limited. I almost left the Broviac catheters back because I knew they could not be used for vascular access in Africa. At the last minute, I packed a few, thinking maybe they would still come in handy. I never anticipated using them in this manner. We have to work quickly. The spinal anesthetic is good for only 45 minutes and the baby will then start to move and feel the pain. We have no scrub nurse. 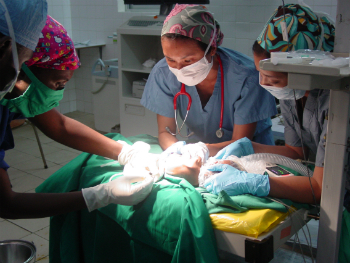 Robin, a surgical resident from the University of Virginia, is fulfilling that role and helping us as fast as she can. The anesthesiologist updates us every 5 minutes. We complete the operation just as the baby starts to move his legs. It was a moment of triumph we could all enjoy, even if the baby’s future is still very tenuous. In this moment, an American pediatric surgeon from Montreal, a Rwandan surgeon aspiring to help children, a surgical resident from Virginia, an anesthesiologist from Boston Children’s, an anesthesia resident from Harvard, a Rwandan anesthesia trainee, and a Rwandan nurse all came together to find an African solution to an African problem. Photo above left: Broviac catheter in place after success surgery to access the intestine for feeding. In the photo above: A moment of triumph. 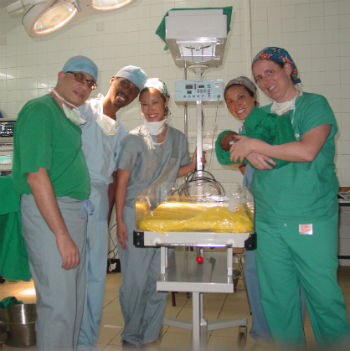 From left, Dr. Emil, Dr. Ntaganda, Beverly, Dr. Denise Chen, and Robin holding the baby. Dr. Sherif Emil  is a pediatric surgeon and Director of Pediatric Surgery at the Montreal Children's Hospital. His trip to Rwanda is part of a McGill program to train surgical residents at the National University of Rwanda and the Centre Hospitalier Universitaire Kigali.